When heated to decomposition, Cyanuric fluoride emits very toxic fumes of fluorides and nitrogen oxides. Avoid decomposing heat. 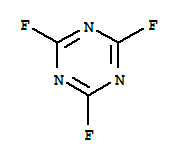 Cyanuric fluoride is highly toxic by skin contact and inhalation. Inorganic oxidizing agents can react with reducing agents to generate heat and products that may be gaseous (causing pressurization of closed containers). The products may themselves be capable of further reactions (such as combustion in the air). The chemical reduction of materials in this group can be rapid or even explosive, but often requires initiation (heat, spark, catalyst, addition of a solvent). Explosive mixtures of inorganic oxidizing agents with reducing agents often persist unchanged for long periods if initiation is prevented. Such systems are typically mixtures of solids, but may involve any combination of physical states. Some inorganic oxidizing agents are salts of metals that are soluble in water; dissolution dilutes but does not nullify the oxidizing power of such materials. Organic compounds, in general, have some reducing power and can in principle react with compounds in this class. Actual reactivity varies greatly with the identity of the organic compound. Inorganic oxidizing agents can react violently with active metals, cyanides, esters, and thiocyanates. Explosives often consist of an inorganic oxidizing agent mixed in intimate contact with a reducing agent. Gunpowder is such a mixture. Other examples are a mixture of sugar (an organic compound) plus sodium chlorate and magnesium (an inorganic reducing agent) plus barium peroxide. Compounds that inherently contain a group that is a reducing agent and an oxidizing agent are classed in both Group 44 (Inorganic Oxidizing Agents) and in Group 45 (Inorganic Reducing Agents; for example, ammonium nitrate). The strongly oxidizing elements oxygen and fluorine are classified here. Inorganic oxidizing agents that are also acids (such as nitric and perchloric acids) are not included in this group. They are in Group 2 (Acids, Inorganic Oxidizing).